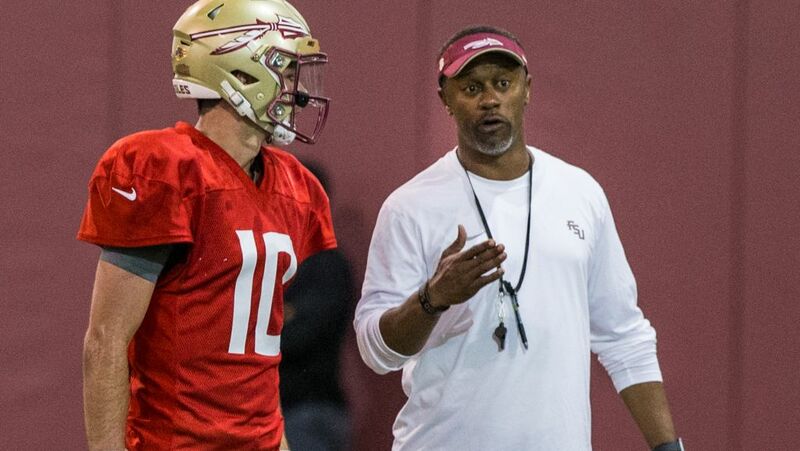 TALLAHASSEE, Fla. – Florida State’s second spring scrimmage left coach Willie Taggart feeling much the same way he did after the first. There was some good, some not so good and a whole lot of room to improve between now and September. With an April shower soaking Tallahassee, the Seminoles moved inside to the Albert J. Dunlap Indoor Practice Facility for four quarters of in-game simulation. And, unlike last week’s situational scrimmage, this one bore a close resemblance to the real thing. There were no kickoffs, but there were punts. Tackling was live – except for on quarterbacks – turnovers counted and the clock started and stopped the way it would on a Saturday this fall. Defense still a step ahead, but offense showing signs of life: As is typical across the country, Florida State’s defense has had the upper hand on its offense for much of the spring and that pattern held true on Saturday. While sometimes frustrating, this is usually a good thing. As Bobby Bowden (who spoke at Taggart’s coaches clinic earlier in the day) once said, if your offense is better than your defense in March and April, it probably means trouble in September and October. Defensive coordinator Harlon Barnett’s group certainly held up its end of the bargain on Saturday, making yards hard to come by both on the ground and through the air. Hamsah Nasirldeen set the tone early with a physical interception in the middle of the field, and Izaiah Prouse-Lackey followed that up with a deep, third-down pass break-up a few moments later. As has often been the case for the last few weeks, Brian Burns had a dominant afternoon. The junior defensive end spent much of the afternoon in the backfield, with multiple sacks and pass deflections. That’s not to say that the offense didn’t have its moments, particularly as the scrimmage wore on. James Blackman got things started with a deep touchdown pass to Keith Gavin down the left sideline, while Khalan Laborn got his group in rhythm with a steady string of gains that kept the chains moving. Blackman and D.J. Matthews later connected on perhaps the prettiest highlight of the day: A rainbow of a pass down the middle of the field that Matthews hauled in while losing his footing at the goal line. Moving forward, Taggart wants to see the offense put more pressure on the defense through precision and execution. It’s fine that the defense is making plays, of course, but he prefers that those plays happen the right way – and not just because the offense made a mistake. Wilson making moves on offense: Ontaria Wilson has officially been a receiver for a little more than two weeks, but he looked like a seasoned pro at the position on Saturday. The redshirt freshman and former defensive back made his mark with a pair of back-to-back grabs that singlehandedly delivered a touchdown. It started with a catch of about 50 yards on first down that Wilson grabbed near the right sideline. Just a few seconds later, Wilson caught another deep ball over his right shoulder for an easy score. Wilson nearly struck for a third highlight later in the scrimmage, when he ran stride-for-stride with his defender then ducked away from the coverage toward the right sideline. He made a pretty diving grab to complete the pass, but officials ruled that he landed out of bounds. Organizational chart flowing: With nearly five months to go until Florida State’s season opener and a number of contributors sidelined with injuries, it’s virtually impossible to determine starters at several positions. And Taggart, no surprise, likes it that way. Not only is there guaranteed to be plenty of competition for a long time to come, but it also allows several players to get extended reps with the first- and second-team offenses. Take running back for example, where Laborn, Amir Rasul and Jacques Patrick all cycled through different units. Same goes for tight end (Tre’ McKitty, Naseir Upshur and Gabe Nabers), on the offensive line (where coach Greg Frey tinkered with different combinations for much of the afternoon) and virtually every position on defense. QBs to battle through fall: Speaking of competition, don’t expect much clarity on the quarterback depth chart for a while. Taggart said Friday that each of his three QBs – James Blackman, Bailey Hockman and Deondre Francois are still learning, and that it will take much longer than a month of spring camp to determine which gives the Seminoles their best chance to win this fall. Which is just fine for all three contenders. More former Noles present: The sidelines at the IPF were awash with area coaches in town for Taggart’s clinic, but there were still a few familiar faces in the crowd: Corey Simon (1996-99), an All-America defensive tackle and 1999 national champion, took in his first practice of the Taggart era, as did All-America receiver and 1993 champ Kez McCorvey (1990-94). Also in attendance was former FSU quarterback Adrian McPherson (2001-02), who, like Taggart, is part of the lineage of quarterbacks from the Bradenton-Sarasota era. Up next: The Seminoles are due to draft teams for next week’s Garnet and Gold Game (April 14, 6 p.m.). They’ll then take Sunday off before returning to the practice fields on Monday, Wednesday and Thursday.